IF YOU ALREADY OWN A MARANTZ PMD661MKII YOU MAY STILL PURCHASE SOME OF ITS ACCESSORIES FROM OUR PMD661MKII WEBSHOP BELOW. 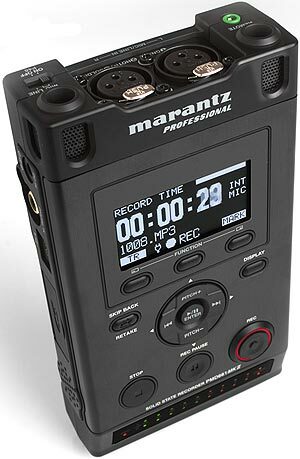 The Marantz PMD661MKII (Mark 2) recorder is based on the PMD661 Mark 1 version which is now in our product archive if you would like to review its description and features. That page will give you a good overall picture of what the PMD661 offers before reading this page which concentrates more on the enhancements the PMD661MKII brings to the PMD661 party. The PMD661MKII sports a further refined professional broadcast feature set, maintaining the improved top facia layout with fewer buttons and more highly developed use of multi-functional operation previously seen in the original PMD661. Measuring just 165 x 93 x 36 mm (6.5" x 3.7" x 1.4"), and combined with the improved control layout it ensures comprehensive single handed operation. The feature set includes an integrated high quality stereo condenser microphone array for ‘point and shoot’ operation, and a highly visible 128 x 64 dots matrix OLED (organic LED) display. 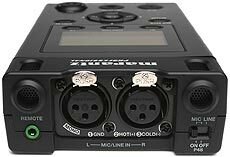 The PMD661MKII features balanced mic and balanced line XLR inputs, as well as unbalanced line outs on RCA connectors and a secondary unbalanced line in on 3.5 mm mini jack connector. 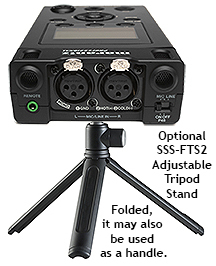 Also included is a high resolution 24-bit/96kHz recording option (PCM). The PMD661MKII utilises SD flash media, the most widely available and fastest developing flash memory format. Compatibility with SDHC media means that cards currently up to 32 GB in size can be used. High capacity media storage is matched by five hours recording time from four AA Alkaline/Ni-MH batteries. Drag and drop file transfer is supported via the USB port. Feature improvements over the original PMD661 include new built in SD Card Check so it is easy and convenient to insert any SD card and check compatibility before investing in multiple cards that may not match the high performance of the PMD661MKII. This is a major improvement as users of the PMD660 & PMD661 will all tell you how fussy those recorders were about the cards they would work with (unlike any other brand). Journalists on the move, up against tight deadlines will make use of the new ‘Retake’ feature which allows a simple button press to take you back though the previously recorded audio to edit the record start point. This enables easy re-recording over unwanted takes and offers a solution for quick editing on the move without the need to edit on a computer. 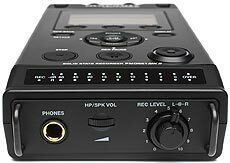 New Secure Audiofile Recording features have also been added into the PMD661MKII with Password Protection and File Encryption that work hand in hand to keep recordings safe form unauthorised access. 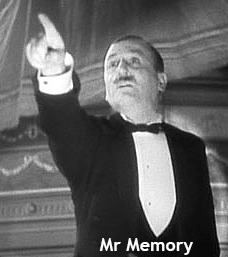 MP3 files can be encrypted to .MPS files and WAV files encrypted to .WAS files which utilise the 4 digit password protection feature so that only those with the 4 digit password can open and play the files either on the player or in the new updated PMD Marker Editor software, included in the box.